Central Connecticut vacations are dominated by the Connecticut River and offer a destination rich in culture, history, art, and natural beauty. Add in big city diversions like Hartford, a second-to-none aviation museum, and one of the largest collections of Dinosaur tracks in North America, and you’ve got a bunch of no-time-to-be-bored adventures waiting for you to discover. Andover, Avon, Berlin, Bethany, Bloomfield, Bolton, Branford, Canton, Cheshire, Chester, Clinton, Cromwell, Deep River, Durham, East Granby, East Haddam, East Hampton, East Hartford, East Haven, East Windsor, Ellington, Enfield, Essex, Farmington, Glastonbury, Granby, Guilford, Haddam, Hamden, Hartford, Hebron, Killingworth, Madison, Manchester, Marlborough, Meriden, Middlefield, Middletown, Milford, New Britain, New Haven, Newington, North Branford, North Haven, Old Saybrook, Orange, Plainville, Portland, Rocky Hill, Simsbury, Somers, South Windsor, Southington, Stafford, Suffield, Tolland, Vernon, Wallingford, West Hartford, West Haven, Westbrook, Wethersfield, Windsor, Windsor Locks, Woodbridge. My Central Connecticut Vacations map includes all the major routes to get around and enjoy the wonders of the region. For more information on a specific Central Connecticut vacation attraction just click the relevant link. Hartford has everything you’d expect in a big city… fine lodging and dining, shops, and theaters. But there are a number of destination points that make Hartford unique in New England, and worth including on your itinerary. Mark Twain House was Samuel Langhorne Clemens home for 17 years (1874-1891). Situated at 351 Farmington Avenue it’s the place where he wrote some of his most beloved of novels, and where his pen was put to effect use as a wit and humorist. The house has 19 wonderfully furnished rooms and is a National Historic landmark. You’ll discover Twain’s possessions littered throughout the house, and many other artifacts displayed in the museum wing added in 2003. If you’re still in the literary mood then the home of the woman that wrote “Uncle Tom’s Cabin” is close by… like next door! The Harriet Beecher Stowe House celebrates the life and times of the author that’s most remembered for the work that galvanized the slavery abolitionist movement. Harriet Beecher Stowe’s last residence is open to the public as a museum. 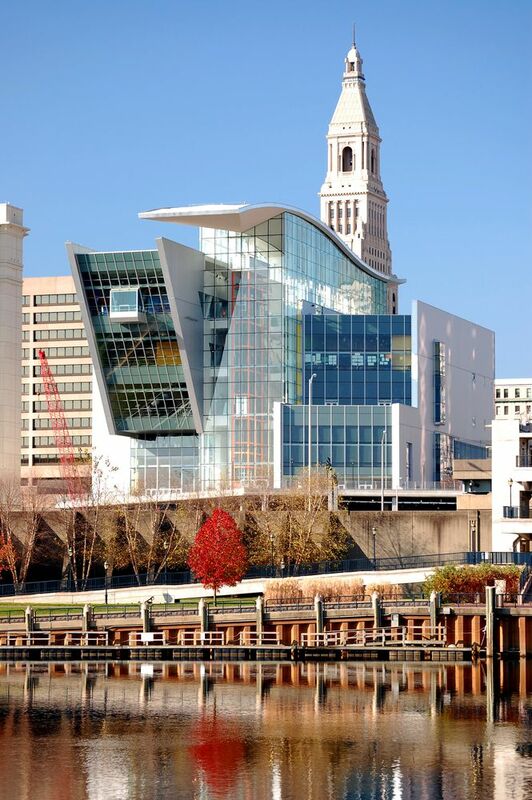 The vital Connecticut River runs through Hartford, and can be enjoyed as a lunchtime break at Riverfront Plaza. Here you can take a riverboat cruise, relax and walk in splendid gardens, grab a bite to eat on a park bench, or just enjoy a break from the traffic and hustle of the big city. Keeping parks as a theme for a minute, two unusual park locations in the city can be found at Elizabeth Park, where the world-famous rose garden and path walks will keep you in awe for hours… and Bushnell Park, where a stunning Carousel and accompanying authentic Wurlitzer organ is a delight to both children and adults. These are both popular destinations for families on Central Connecticut vacations. The Old State House in downtown Hartford was one of the first in the nation. Designed by Charles Bulfinch, who designed the famous State House in Boston, and completed in 1796, it has a number of chambers, council rooms, and a courtroom open to the public. A short hop away is the Hartford Civic Center , which is the entertainment and sports complex hub of the area. Here you can see professional basketball, hockey, and music performers when they come to town. Let’s round out your brief tour of Hartford with a trip to the Science Center of Connecticut in West Hartford. This is a hands-on museum that explores science, nature and technology. Galleries at the center cater for the youngest to the most sophisticated adult minds. Permanent exhibits include Idea Zone, KIDS’ Factory, PlanetCyber, Turtle Town, UTC Wildlife Sanctuary, and ViewSpace. The Gengras Planetarium always has exciting shows, and I highly recommend you attend one of the amazing Laser shows. Where Can You See Hot-Air Balloons, Missiles and Rockets on Your Central Connecticut Vacations? Answer… at the New England Air Museum at Windsor Locks north of Hartford. Fittingly close to Bradley International Airport, the museum has over 70 aircraft from all periods so you can travel through the history of aviation. The exhibits are housed in three large hangers, and include fascinating displays on Early French Aviation, WWII Gliders, Airships and Balloons, History of Air Mail, and much, much more. You’ll be able to take a close look at many of the planes used during and after WWII, including the recently renovated B-29 Superfortress – a popular attraction – and the North American B-25 Mitchell, the P47 Thunderbolt, the Vought Corsair and the Grumman Hellcat. Planes and airports have always fascinated me since the days I lived by a busy capital airport, and soaked-up the roar of the engines. As a kid I imagined all the exotic places and adventures the passengers would be visiting. In 1966 2,000 Dinosaur tracks were uncovered during excavation work for a new building. Two years later Dinosaur State Park opened in Rocky Hill. Now while on your Central Connecticut vacations you can enjoy 500 perfectly preserved Dinosaur tracks from the early Jurassic period. And how about this… you can even make plaster casts of the tracks – you’ll have to bring your own materials as they aren’t supplied, but what an unusual project to do with your kids? And while the highlight of the park are the tracks, there’s also more than two miles of nature trails and many plants representative of the flora which appeared in the Dinosaur age. Park the car and ride a historic trolley through New Haven, or take a steam train and riverboat ride from Essex and along the Connecticut River. These exciting rides make wonderful destinations and sightseeing trips. The Shore Line Trolley Museum in East Haven is the oldest operating trolley museum in the U.S.
You can take a ride and tour the vintage collection of 100 classic trolleys on display. The ride is a 3-mile scenic trip on a fully restored vintage trolley car over original tracks. Here’s a chance to experience the way most people traveled in Connecticut before the automobile took over. The guided tour in the museum is an enjoyable peep into the history of the trolley system in America, and a chance to see restoration of cars in progress, and hands-on presentations of the technology behind the trolley. 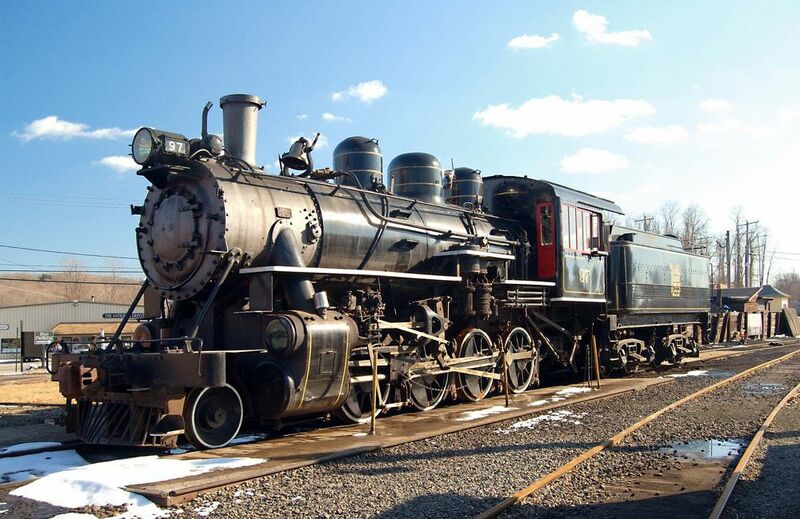 Essex Steam Train and Riverboat in Essex is a combination thrill ride aboard a vintage steam train and a riverboat cruise along the Connecticut River valley. For 2 ½ hours of your Central Connecticut vacations you can sample the rich transportation past of the region. Start your journey at the historic 1892 Essex station where your steam train will wind its way through the lush countryside to Deep River Landing. At Deep Landing docks you’ll board the Becky Thatcher for a 75-minute cruise along the Connecticut River among breathtaking scenery and vistas of historic landmarks such as Gillette’s castle and Goodspeed Opera House. On return to the dock the Steam Train locomotive will speed you back – at 20mph – to Essex Station. Special seasonal runs are made in the Fall, and reservations for the wildly popular North Pole Express Santa Run can be made starting October. Also in Essex you’ll find the Connecticut River Museum where you can explore a working reproduction of America’s first submarine – the Turtle. The history of the Connecticut River vividly comes to the life as told through the paintings, artifacts, and interactive exhibits in the four galleries of the museum. It’s fitting that we complete our brief tour through Central Connecticut where we started – on the Connecticut River. A vital link to the past and continued source of pleasure and enjoyment for people on their Central Connecticut vacations. The Hartford region will provide you with enjoyable scenic drives along quiet rural lanes in Wethersfield and Rocky Hill and Glastonbury areas. Take time out to explore the generous selection of antiques and bargain shops along they way. The perfect Connecticut vacation memorabilia is waiting for your discovery. The Connecticut Wine Trail has three wineries in the Central Connecticut region. These are Gouvein Vineyards in Wallingford, Bishops Winery in Guilford, and Chamard Vineyards in Clinton. For maps and specific tour information check out the Connecticut Wine Trail.